Applies easily with water. Simply remove easily with baby oil or rubbing alcohol. 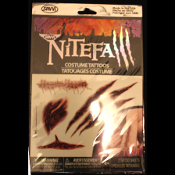 TWO Tattoo Sheets per package, as pictured. Each sheet approx 5-1/4-inch high x 6-inch wide. Individual Tattoos vary in size between 1-1/2-inch to 4-1/2-inch. *Caution: *Don't apply to sensitive skin, near eyes or if allergic to adhesive. Ingredients: Acrylates Copolymer, petrolatum, mineral oil (paraffinum liquidum), linum usitatissimum (linseed) seed oil, glycine soja (soybean) oil, polyethylene terephthalate, petroleum distillates, cerium carboxylate, manganese 2-ethylhexanoate. May contain: black 2 (Cl 77266), blue 1 (Cl 42090), yellow 5 (Cl 19140), yellow 6 (Cl 15985), red 7 (Cl 15850:1), titanium dioxide (Cl 77891).